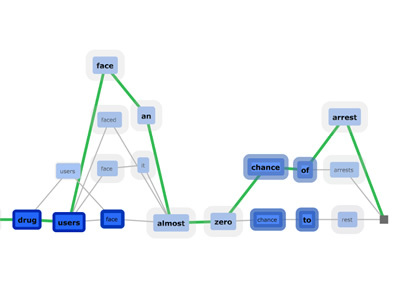 Lattice graphs are used as underlying data structures in many statistical processing systems, including natural language processing. Lattices compactly represent multiple possible outputs and are usually hidden from users. The authors presented a novel visualization intended to reveal the uncertainty and variability inherent in statistically-derived lattice structures. 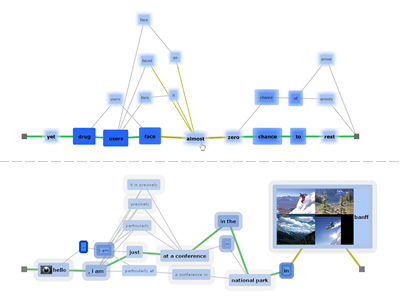 Applications such as machine translation and automated speech recognition typically present users with a best-guess about the appropriate output, with apparent complete confidence. Through case studies they showed how the proposed visualization uses a hybrid layout along with varying transparency, colour, and size to reveal the lattice structure, expose the inherent uncertainty in statistical processing, and help users make better-informed decisions about statistically-derived outputs.